I`ve been a fan of Pokémon for almost 12 damn years now. I was introduced to Pokémon by my cousin Faddy. He used to bring his Gameboy Color to our house when we were little kids and showed me a game called Pokémon: Yellow. I got hooked with the game and even asked my parents to buy me a Gameboy Color(I play Pokémon: Red Version! xD). I (or should I say "WE") grew up with Pokémon, loving them, play with them. I watch the anime, I collect/play the trading card game and I even started to collect their figurines! I bought (A small PVC) two Piplup, Monferno and a Croagunk yesterday! Pokémon is like a non-stop adventure for all of us! According to Wikipedia, a total number of 493 Pokémon have appeared in the anime and games! Out of 493, I listed here my top 10 favorite Pokémon. Darkrai is a black, shadow-like creature. It has a small black head with a white substance erupting from its head covering one of its bright blue eyes, and also has a red growth around its neck. It has skinny arms and long black tatters hang from its shoulders. It has an hourglass figure and appears to be wearing an old, ripped cloak. It normally doesn't have any sort of legs, but it is able to extend stilt-like appendages in their place. 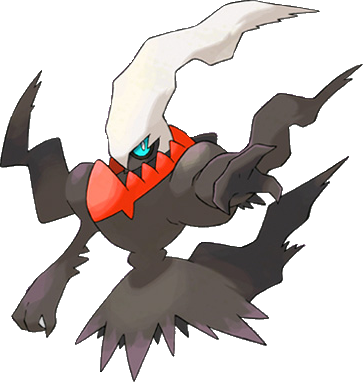 In self-defense, Darkrai also appears capable of retracting its head and white "plume" into the pit atop its torso fringed by the aforementioned red growth. 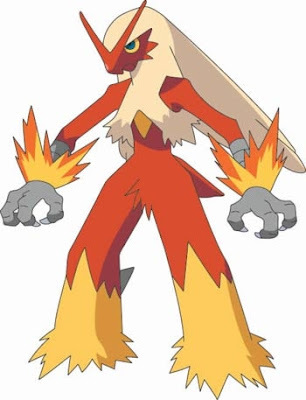 Blaziken appears as if it's wearing a sleeveless jacket on its torso. It has a crest on its head with two points, which resembles a letter "V". It also has long hair behind its head and a small face almost completely covered in feathers. Its strong, muscular legs help it jump up a skyscraper with one kick and with ease. Lastly, it has three fingers on each hand, with what appears to be wristband-like markings on its wrists. These ignite when Blaziken is threatened. Teddiursa are small, mammalian Pokémon that resemble bear cubs. They have short brown fur that covers their body, except for their mouth and the crescent moon marking on their heads, which are a light tan. 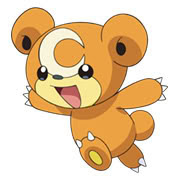 Teddiursa have small, round bodies with short limbs and a short, puffy tail. They are reminiscent of teddy bears. Squirtle is a bipedal turtle with its most notable feature being the hard shell on its back. This shell forms and hardens on its back after birth. 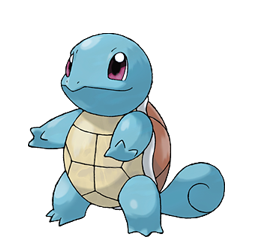 It could perhaps be distantly related to some other turtle-like Pokémon, such as Torkoal and Turtwig, but Squirtle seems to only be closely related to its evolutions. Squirtle's shell is an extremely helpful defensive tool. It can withdraw into the shell to block physical attacks. Its smooth, hard shell and head also aid it in other ways, such as minimizing its resistance in water to increase its swimming speed, and allowing it to launch attacks like Rapid Spin and Skull Bash. Squirtle is a natural-born swimmer. However, due to its size, it's easier for it to transport something small (like a Pikachu) than to carry its Trainer. Its jaws may not look like much, but they are strong enough that a Squirtle can learn to use a Bite attack. Squirtle's tail ressembles a squirrel's tail, which allows it to use moves such as Tail Whip and Aqua Tail. Mewtwo is a creature with a humanoid posture, but has many feline features. Mewtwo's body is grayish-purple with a purple underside and a long, purple tail. Mewtwo has three digits on each appendage. It has purple eyes and two short ears. 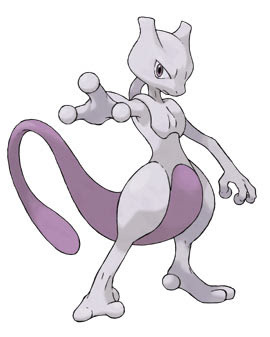 One of Mewtwo's most notable features is the tube extending from the back of its skull to its spine. It is most likely a secondary spinal cord, or a system of nerves, allowing for an increased amount of blood and sensory transmission to the brain, heightening its psychic powers. Mew is normally described as a pink cat-like creature. Mew's hair is so fine, it can only be seen under a microscope. It has a long, skinny tail. Mew has big hind legs, like a rabbit, and short arms with three-fingered paws. Mew has triangle-shaped ears and baby-blue eyes. 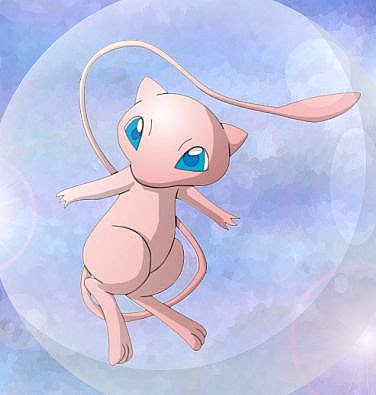 Mew is said to have the DNA of every single Pokémon. It also vaguely resembles a fetus, and is often depicted in a pink orb similar to a womb. Who doesn`t know Pikachu, popularly known as the mascot of the Pokémon franchise? A Pikachu is a short, chubby, ground-dwelling rodent notable for its Electric abilities. Pikachu have short, yellow fur with brown stripes on the back, black-tipped ears, along with an unusually shaped tail, resembling a lightning bolt. Chimchar are based on chimpanzees. Being very agile, Chimchar are able to climb the rocky ledges of tall mountains, where they live. The flames on their rears are produced by burning gas in their stomachs. Chimchar also has a swirl-like symbol on the chest. The flames do not go out in the rain, and, unlike the tail flames of Charmander, those of Chimchar go out when they go to sleep. 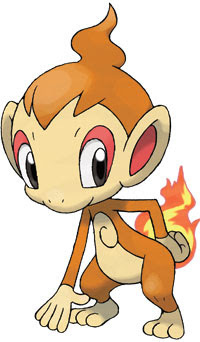 Despite being based on chimpanzees, Chimchar's cry is actually much more similar to that of a spider monkey. 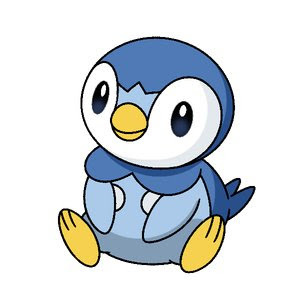 Piplup resembles a penguin chick and also looks a little bit like Torchic. It has yellow feet and a light-blue body. There are two white spots on its chest that seem to resemble buttons on a suit. It also appears to have a blue cape. It has a circular, blue head with white circles around its eyes and a small, yellow beak. 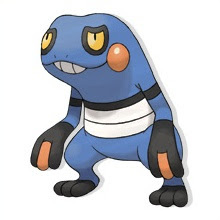 Croagunk resembles a dark blue bipedal frog, with a white band around its waist area and red and black markings on its hands and feet. Its coloring and poisonous nature suggest that it is based on poison dart frogs. The markings on its body make it look like a Muay Thai fighter, and its jutting teeth make it appear to be wearing a mouthguard. The black around its eyes and the white bands make it look like an injured fighter with black eyes and broken ribs. Its cheeks are filled with a poison that runs to its fingers, allowing it to poison opponents by stabbing them. i'm also a pokemon fan. I had played all pokemon series up till platinum series (halted due to school). although not as enthusiastic as i was, the anime series still nv failed to attract me :). comrade!! gotta catch them all!! They are really cute.I love watching these type of cartoons.Thanks for sharing.I can keep the pictures.